Joseph P. Covington appointed as Independent Compliance Monitor to SNC-Lavalin Group Inc., by the International Bank for Reconstruction and Development and International Development Association (World Bank), with a mandate to review and evaluate the company’s global anti-corruption compliance program. FCPA compliance audit and counseling on remediation related to past conduct for overseas operations of a major international company spanning nine Sub-Saharan African countries. Compliance counsel for a multinational agriculture industry company, providing ongoing counseling services and conducting FCPA due diligence for acquisitions and business partners located in Myanmar, Uganda, Kenya and the Democratic Republic of Congo. Compliance audit at an overseas location of a Fortune 500 corporation covering financial/accounting analysis, assessment of legal risks and adequacy of policy implementation, and conduct of foreign-language (Spanish) interviews. Representing a small construction company in a DOJ grand jury investigation of possible corruption in Gabon. Counseling and guidance to the German subsidiary of a Fortune 50 manufacturing company on the legality of employing an elected official, including an assessment of internal controls and advice on remediation. Representing an international investment institution to provide advice and guidance on the adequacy of the company’s due diligence of third parties in several African countries. 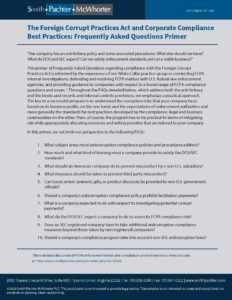 Counseling and guidance to an airplane manufacturing company on FCPA-related money laundering issues arising out of the sale of goods to customers in a West African country.